I am going to start off this month with a bit of a whinge. A whinge at myself. I hate winter! There I have said it. Don't get me wrong, the festive season is always an annual treat loved by all, including me. What I hate is the short days, the constant cold and associated bad weather. Now most dubbers, use this time to lock themselves away to prepare and implement their fresh look for the following season. Tending to the bigger jobs that are little more involved and time consuming. Not me though, ohh no, I am more like a bear. A big dumb bear at that, one who would happily go into hibernation until spring starts to break through. I also have the motivation of a sloth during the winter months. 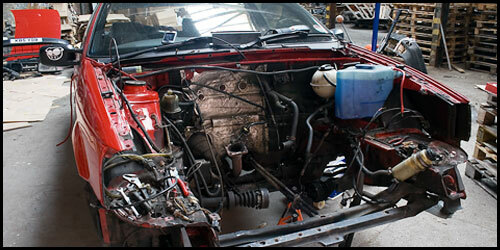 In my infinite wisdom I chose April as the perfect time to finally get round to my planned engine swap. At 10pm on day one, after a 13hr day we were still trying to pick the bones out of the MK3 loom, hoping that with fresh eyes we will see the light at the end of a very dark tunnel. The call was made to down tools and come back to it in the morning. We set off for home, only stopping to collect a curry en-route. Back to it bright and early, all we needed to do was crack this loom millarchy, thread it all back in, drop in the motor, turn the key and hey presto! Well that was the plan at least. As the hours passed by we started to completely lose the will to carry on. My phone rang which thankfully broke the blokey silence. My brother had found a B3 Passat in a local scrap yard which had a fog light surround that Craig had been after. With very little encouragement from each other, we used this as an excuse to run away from the wiring loom nightmare, and go and play in the scrap yard. There, in the corner of the yard, being squashed by another car was a rather sad looking B3. Craig being the engine man he is, went straight for the bonnet. As if by some stroke of luck, a magical moment, a twist of fate, whatever you want to call it, right there and then our wiring loom nightmare came to very sudden and very abrupt end. Because before our very tired eyes was a 2.0 16v 9a engine!!!! The car still had all four discs and calipers on (mine rocks drums at the back), a full GT interior, loads of black plastic and a rear load cover. Craig, with a look of disbelief and happiness on his face, said 'if it fires we'll have it'. He connected the battery, stuck his arm though the window and turned the key.....the old girl fired straight away! Our nightmare was over. After going in there for a fog light surround, we ended up walking away with a whole car. We got back to the dub cave tidied up the tools, moved the three engines that are now living in there, and generally made room for another car to be stored. You have never seen three blokes move so quickly, it was truly impressive. Just don't tell the wives we can move that quickly though. They may come to expect it all the time. A day later the donor car was delivered to the cave on the back of a flatbed tuck. With a bit of skilled (read that as lucky, very lucky) fork lift truck driving by me. It was safely stored in the cave. Sat next to Yogi, it did look very sad indeed. The following week with my car being out of action, was a right pain in the posterior! Had to ride to work every day, ran the wife to work so I could use her car on the Saturday. What a ballache! In my mind, I kept telling myself it is all part of the journey, the end result will be worth it all. With enough already on our plates, you would think we would be mad to take on another project, right? Well when you are in for a pound, what's another penny on top? I still think we have got this saying the wrong way round, which maybe why we ended up finding ourselves driving from Blackpool down to Norfolk to A frame another 16v B3 Passat all the way back up. With a 5:30am start we embarked on a mission to save a second B3 Valver in less than a week. This was the day off Craig and I both deserved, the sun shone down on us all day, the journey went a dream. With only a few 'moments' as you would expect using a stripped out B3 Passat to A frame a fully loaded B3 Passat. 4:30pm we were back home, job done! Victor, as the new car is affectiantly now known, is currently being treated to some light servicing/repairs to get him road legal. During our road trip, we got a hint that my donor car might be a bit of an oil burner. Gutted!! So plan C was hatched. Drop the original motor back in, and re-build the Valver engine. The last thing I would want is to get the engine in to find out it had to come back out for a re-build. Again I told myself it's for the greater good, the end result will be worth it. It better had be! Sunday rolled round, and back into the cave at 7:30 am. Dropping the original loom and motor back in should be a doddle, we'll have it done easily by tea time. WRONG!! We rolled out at just gone midnight! It is surprising how undoing all the work from a previous week, can really have a negative effect on your working pace. Enough to do there? You would think so wouldn't you. Imagine if your 'friends' start whispering about engine mods, you would naturally expect yourself to tell them to go forward and multiply, and simply choose to ignore the whispers. Not stupid old me! I have now sourced some mild cams, along with some bike carbs. When will this end? Damn it hasn't actually even started yet! Back to my opening statement, if I wasn't so lethargic in the colder, darker months I would have lived all of this months ago and would be now enjoying the fruits of my labor. Well I hope this is a lesson learned for me, I wouldn't put any money on it though, as I really do hate winter! Whatever you have been up to, I hope you had as much fun as me, and whatever you are up to I hope it all goes well for you. Hopefully I will meet a few of you The Gathering, and by then plan C will be completed, fingers crossed! I had personally missed this build until this month. It is another cracking build. Starting out with a very standard B5 wagon, and ending up as a fully modded cruise missile. It doesn't appear that Cabriootje is showing any signs of slowing down either. Currently rolling on 19" Holsten's on air, RS6 seats, and plenty of other OEM touches, there really is something for everyone in this build. The nominations for May Car Of The Month have begun, click here to make your voice heard. One minute, you're out there with a bucket and tattered sponge, using washing up liquid and whatever else you can find under the kitchen sink next to the ant powder and dishwasher tablets. Next, you see something about 'detailing' on a forum, decide to give it a go and buy a small arsenal of specialist products that your Dad would term 'a ludicrous waste of money'. Don't be worried. This is a good thing. Your car will thank you for it. And your Dad's Vauxhall Belmont has more swirls in it than a seventies carpet, so his opinion can be safely disregarded. There are hundreds of different ways to detail your car. But if you want to do it Dodo-style, here's how. We've divided the process up into four basic sections, from the basic washing of the car through to regular maintenance. We mention a few of our products along the way, but you can often mix and match with stuff you already have from other manufacturers. Just make sure you have fun and end up with a clean, shiny car. Or if you don't want to do it yourself, get a Dodo Authorised Detailer (DAD) in. 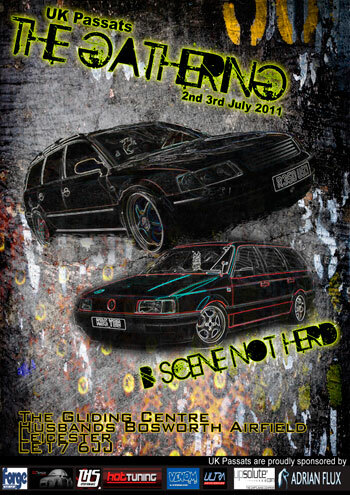 Dodo Juice are also pleased to announce they are sponsoring the UK Passats - The Gathering 2011 Show & Shine and have also donated products for raffle prizes. - SHOW AND SHINE - JUST FOR PASSATS !!! Possible football match?? (tbc) - you know we all need the exercise ! There is a adventure place at the end of the main runway that is huge so we can possibly work out a special deal here too? Caravans for hire on site for those who dont like camping !